Background: Mortality in HIV/AIDS patients have increasingly been attributed to noncommunicable causes. Since the dawn of Human Immunodeficiency Virus and Acquired Immune Deficiency Syndrome (HIV/AIDS) infection and antiretroviral drugs, there has been conflicting data on the role of Antiretroviral Therapy (ART) use across the globe with no data in Ghana. We studied the prevalence and determinants of isolated systolic hypertension in HIV/AIDS patients on ART. 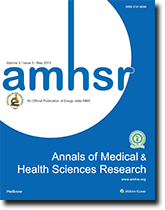 Method: This cross-sectional study involved 200 HIV/AIDS patients who received treatment at the HIV/AIDS clinic of the GA South Municipal Hospital in Accra, Ghana. Blood pressure (systolic and diastolic), pulse and anthropometric (weight and height, waist and hip circumference) data were obtained using standard protocols. Other relevant data were obtained with the aid of a pretested questionnaire. Results: Age, Blood Pressure, Pulse Pressure, BMI and WHR were significantly associated with duration of ART use. The mean systolic blood pressure was significantly high in patients who have been on ART for over 2 yrs. Males were significantly older than females (p=0.003). 4%, 0.5%, and 5.5% of the participants had grade 1, 2, and ISH respectively. Gender was significantly associated with ISH (p=0.021). Females are less likely to develop isolated systolic hypertension. Those within the age group; 30-39 yrs (OR: 7.05, 95% CI: 4.10-12.13, p<0.0001), 40-49 yrs (OR: 3.42, 95% CI: 0.36- 32.10, p<0.0001) 50-59 yrs (OR: 6.13, 95% CI: 0.62-61.03, p<0.0001) are at risk of developing ISH. Conclusion: Isolated systolic hypertension was prevalent in 5.5% of HIV/AIDS patients on ART. Age and gender were the significant determinants of ISH. Efficient and easy accessible measures should be adopted to prevent and control ISH in HIV/AIDS patients on ART especially males and young adults.